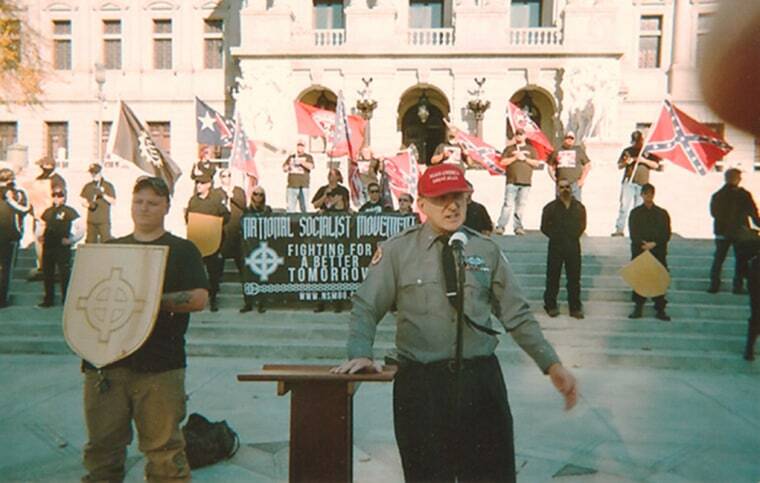 A Holocaust denier who said he is the former head of the American Nazi Party is running unopposed in the Republican primary for a U.S. congressional seat in Illinois, all but ensuring his presence on the ballot in November. Arthur Jones, 70, has tried to run for the seat in the state's 3rd Congressional District, which consists of part of Chicago as well as some of its suburbs, several times since the 1990s. This time, lacking a challenger for the March 20 primary, he will easily claim the GOP nomination. The expectation has renewed focus on Jones's background, which includes ties to neo-Nazis and strong anti-Semitic and white supremacist views. Jones, who claims to be a Vietnam veteran, lays out his platform on his campaign website. It includes stopping illegal immigration, doing away with sanctuary cities and repealing and replacing Obamacare. His campaign slogan: "It's Time To Put America First." "The blood of the Southern Confederate and the Northern Yankee are both in me," he said in his campaign biography. His website also offers sections like "Hate Speech?," which outlines his views on the superiority of whites, and "Holocaust?," in which he claims that the genocide carried out by Nazi Germany that resulted in the murder of six million Jews amounts to the "biggest, blackest lie in history." He also calls the white nationalists who violently clashed with counter-protesters last year in Charlottesville "white patriots." In an interview with The Chicago Sun-Times, Jones defended himself. “Well first of all, I’m running for Congress, not the chancellor of Germany. All right. To me the Holocaust is what I said it is: It’s an international extortion racket,” Jones said. “And given the fact that I’ve got no opposition in the primary, OK, I win that one [the primary] by default all right," he added. The seat, however, is safely Democratic. Hillary Clinton won the district in the 2016 election with 55 percent of the vote and Democratic incumbent Daniel Lipinski has held the seat since 2005. He will face off against Marie Newman in the Democratic primary. Jones, who lives in Lyons, Illinois, has also unsuccessfully run for different elected positions in the Chicago area as well as Milwaukee since the 1970s, according to The Chicago Sun-Times. Maddie Anderson, a spokeswoman for the National Republican Congressional Committee, called Jones a "fringe candidate who has no real connection to the GOP" in a statement. Illinois Republican Party Chairman Tim Schneider also rejected Jones's views in a statement to NBC News. "The Illinois Republican Party and our country have no place for Nazis like Arthur Jones," he said. "We strongly oppose his racist views and his candidacy for any public office, including the 3rd Congressional District."